Personally, I think it's important to express an "attitude of gratitude". It's good to acknowledge that we could easily be a lot worse of if things didn't work out the way they did, either by birthright, or state of health, or general aptitude (whether that's through natural instinct or lessons in life we've happened across). You might be thinking to yourself, I got where I am today by sheer will and hard work, but I doubt you can say nobody even gave you a chance, a foot in the door, a leg up, or maybe an introduction. If you've got ahead by dragging others down and trampling them in the dirt, then I expect this post is not for you. The point is, I think it's healthy to acknowledge the help of others, and that some folks just never catch a break even though they do try their hardest, and that we could be less fortunate or lucky than we are. I want to see that attitude fostered in my children, so from time to time we give thanks before a meal. 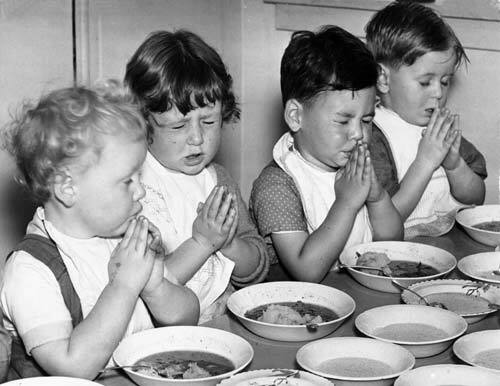 I'm not a religious man, so I don't refer to it as saying grace, or blessing the food, but we do give thanks. We thank the maker, and the provider, and remember those with less to share. I think it covers all the bases, thanks to whoever made this, thanks to who went out and bought it, or grew it, or worked hard to pay for it, and thanks that we are lucky enough to be sitting down together with friends and family to share it together. Some hae meat and cannae eat. Some nae meat but want it. We hae meat and we can eat and sae the Lord be thankit.